Vietnamese President Truong Tan Sang is optimistic that the volume of trade between his country and Russia will rise steadily after a free trade agreement is signed between Vietnam and the Eurasian Economic Union. Vietnam should try and raise the bilateral trade turnover with Russia to $20 billion, once a free trade agreement (FTA) with the Eurasian Economic Union is signed, Viet Nam News cited President Truong Tan Sang as saying. Sang said the trade should rise from the present $2.6 billion once the FTA is signed, as several trade barriers would be removed. Vietnamese businesses would also benefit by getting access to a common market of close to 200 million people. The FTA has been finalized and should be signed within the next fortnight. Vedomosti reported that the Russian Government has already approved the draft agreement. The agreement set for the terms and conditions for the liberalization of trade tariffs between the Eurasian Economic Union and Vietnam, and was approved on May 21, the paper said. It is unclear whether the singing of the agreement will be held at summit-level meetings between Russia and Vietnam. Russian Prime Minister Dmitry Medvedev visited Hanoi in April, and Vietnamese President Sang was in Moscow for the May 9 ceremonies. 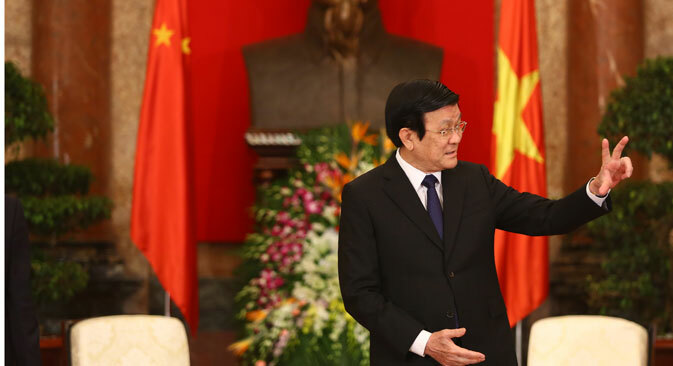 Vietnamese President Sang also called on more of the country’s enterprises to set up shop in the upcoming Russian-Vietnamese industrial cluster in the Moscow region, Viet Nam News said. Russia has 51 percent stake in the cluster, with the remaining 49 percent owned by Vietnam. When the park opens, Vietnamese workers residing in Russia would be given priority to work there and provided with all necessary support in social insurance and housing, Sang said, according to the paper. Garments and textiles, wood, plastics, aqua-culture and food processing were the country's best opportunities for investment in the Russian market, Sang told the paper. 19 Vietnamese enterprises that are already operating in Russia have signed up to move to the park, according to the paper. These enterprises are believed to employ 3600 people. The 120-hectare park will open in September. Including the deal to open the park, Vietnam has invested $2.5 billion in Russia this year. Vietnamese companies are also considering several other investment opportunities in Russia.